It’s the second Tuesday of the month, and time for T-SQL Tuesday. This month’s invitation is from Andy Yun, where he asks you to Just Say No to Defaults. This is the monthly blog party started by Adam Machanic, and it’s the chance for you to write on a particular topic every month. The hosts rotate, so you have to watch the #tsql2sday hashtag for the topic. Posts for the month need to go live during the day according to UTC time. I also keep a list of topics on the blog here, and you should feel free to write about any past topics and post something on your blog. 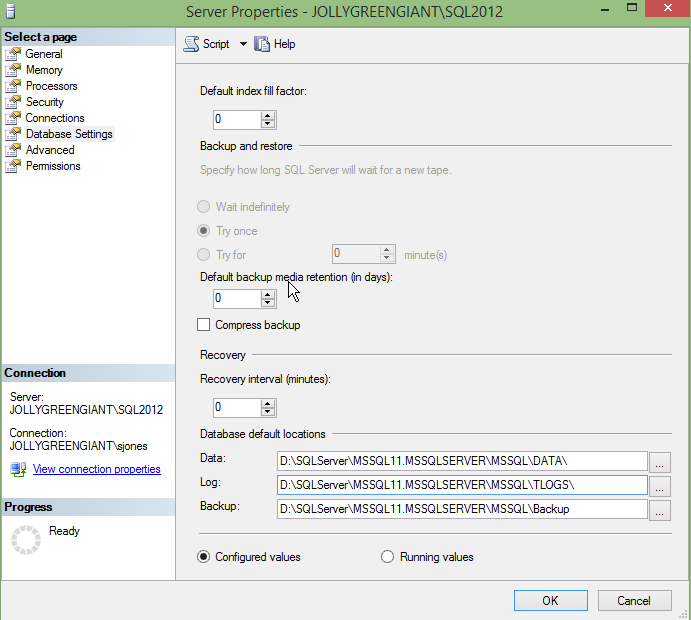 It’s great practice, and a good way to get started as a #SQLNewBlogger. 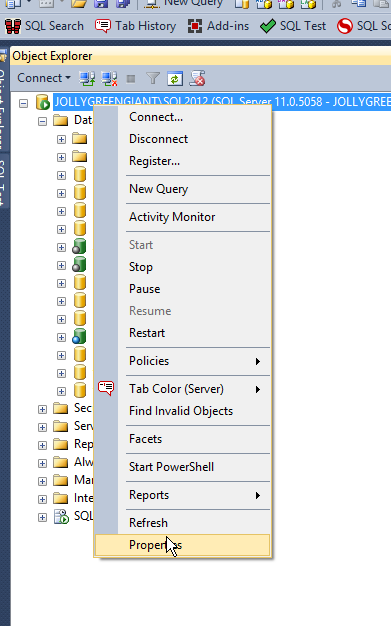 There are all sorts of defaults in SQL Server. The setup program presents you with a number of choices, but in most cases a default exists for setting because SQL Server needs something. I used to have a setup script that I would run for every new install. In a few jobs, back when we used to have physical servers, a hardware person or sysadmin would install Windows and SQL Server onto a new computer and then send me the name for customization. My script, which was really a series of SQLCMD calls in a batch file that in turn called various other scripts, was designed to add an administrative database, create some jobs to track the system, setup backups, and more. The process really did part of what Policy Based Management can do, but was simpler and tailored to ensure that all of our SQL Servers worked in a similar manner. We could override settings, but this quick script gave us a starting point that all DBAs understood. We even ran this on development machines for instances we didn’t manage as it allowed us to troubleshoot other issues, it only took a few minutes, and it removed some of the management headaches from the developers’ minds. However, there is one thing I’ve almost always changed on my instances. I try to do it during setup, but at times I need to do it later. That setting is the default location for files. I do this as I want to usually have data files, log files, and backup files separate from each other. Even if I don’t have different drives, but setting up separate locations here now, I can easily move the files later and make one change here for the defaults and I know I’ll have things separate. I’m not running a new install this week, but I’ll show you how to change it on an instance that’s installed. First, right click the instance in Object Explorer and click Properties. Next, go to the Database Settings section. At the bottom here you see locations for data, log, and backup. In this case, on my laptop, I only have two drives, so I can’t achieve great separation. However in any production system, I’d have the data and logs separated to different physical drives, or at least different LUNs. Backups might go with logs, but they’d ideally be separated to another location. This entry was posted in Blog and tagged administration, sql server, T-SQL Tuesday. Bookmark the permalink.